The United Media Guild turned 80 this year. 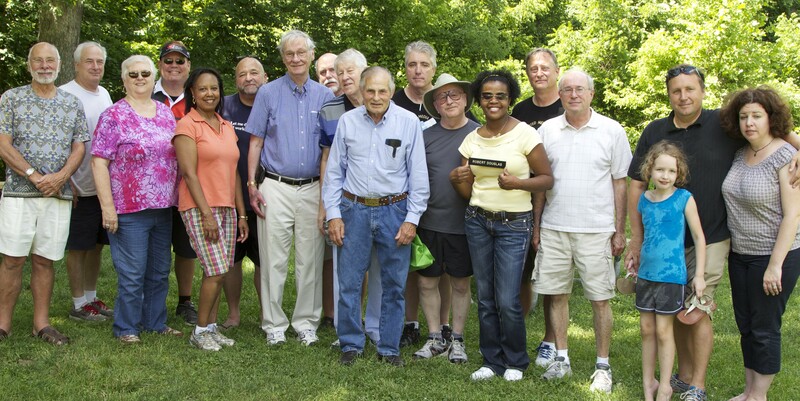 We held a picnic celebration at Creve Coeur Park and welcomed back many of our most prominent retirees and alumni. We were especially pleased to see long-time Executive Secretary Herb Goodrick, who led our Local through many difficult battles while taking great care with our treasury. His tremendous leadership left us in great position to continue fighting for members through the most difficult times the media industry has ever seen. A highlight of the afternoon came when St. Louis Post-Dispatch reporter Michael Sorkin presented Robert Douglas’ old nameplate to Erica Douglas, Robert’s daughter. Robert, a long-time newsroom aide at the Post-Dispatch, died after Lee Enterprises quit paying for his retiree medical insurance and forced him to do without coverage. The UMG waged a years-long legal battle against Lee Enterprises and eventually gained a financial settlement for the impacted retirees. Sadly, that victory came too late to help Robert.